Value Creation – Infographics in Integrated Reports - nexxar lab. A complex matter presented in interactive infographs. More and more companies choose a holistic approach to measure and present their value creation in their annual reports. Following the International Integrated Reporting Council (IIRC) especially the integrated reports should provide insight into the organization’s strategy, and how it relates to the organization’s ability to create value. The capitals are stocks of value that are affected or transformed by the activities and outputs of an organization. The Framework categorizes them as financial, manufactured, intellectual, human, social and relationship, and natural. But not all capitals are equally relevant or applicable to all organizations – or the data is not collected yet. Which is why not all of the capitals are included in every report. This very complex matter of value creation is often presented in infographics – IIRC captures the basic value creation process as described on the IIRC website. Roughly based on this model many companies describe their value creation in infographics that fill 2 or 4 pages of the printed report. Whereas Online Reports offer new and interactive ways to transform the process into easily understandable und interactive infographics. In the following we show three examples we have developed for our clients. The Solvay Integrated Report 2016 chooses a presentation that is closer to the sustainable value creation infographic suggested by the IIRC: the interactive graphic directly links the resources Solvay uses, the business model and markets as well as the created value. Solvay clusters economic, environmental and social in- and outputs. The figures in each section can be compared on one screen and combined individually. A click on each figure leads to further information within the report. Furthermore, strategic objectives are marked by a correspondent icon. The graphic also provides information on the company’s markets. Another example provides Clariant’s Integrated Report 2016 that also takes inspiration from key elements of the International Integrated Reporting Framework. 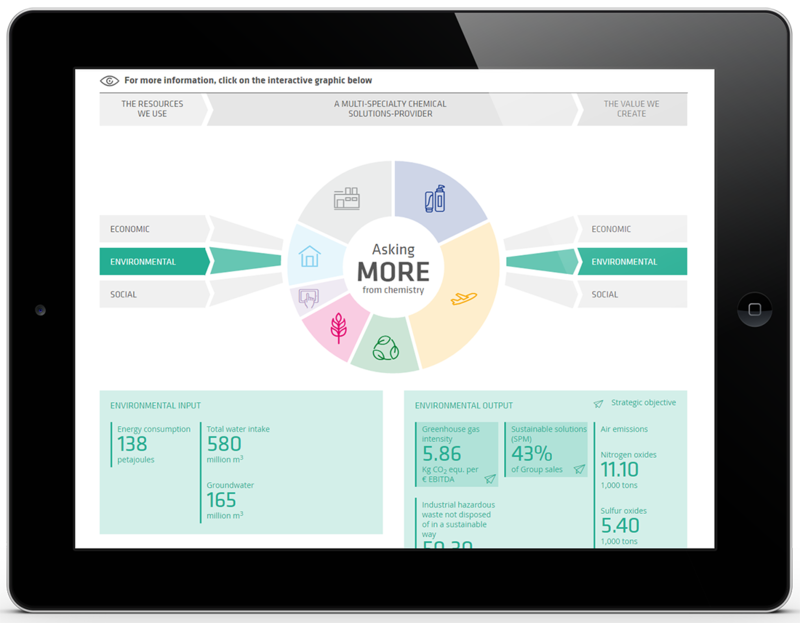 The aim of the interactive infographic is to show that Clariant creates value in more than one dimension. 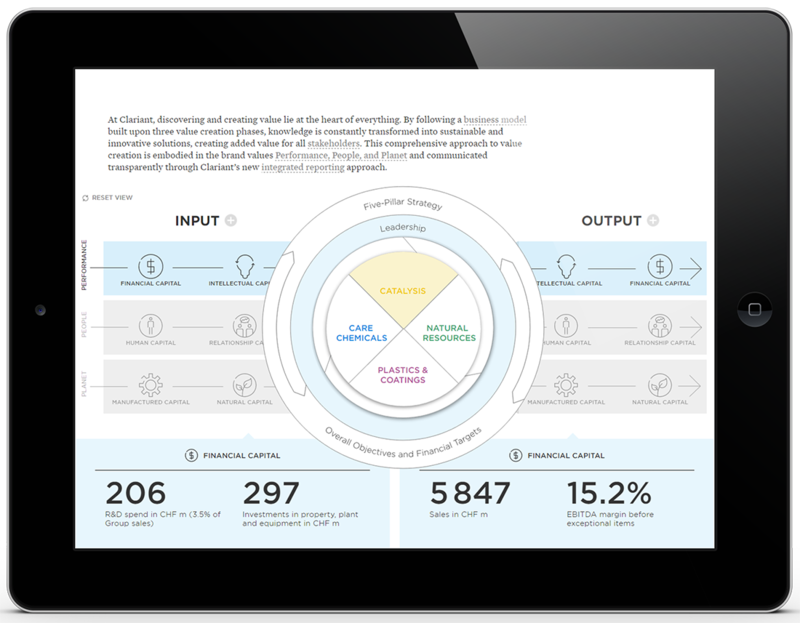 Clariant employs the six capitals and categorizes them under Performance (financial and intellectual capital), People (human and relationship capital), and Planet (manufactured and natural capital). Through the business model, these inputs are converted into outputs for customers, employees, shareholders and the environment. The various in- and outputs can be explored by clicking on the relevant topics opening boxes underneath that provide the information. Each area can be opened individually. What makes the infographic very special is that it contains numerous figures that can be clustered in various ways: by capital category, business area or operational process. A single click on the chosen field reveals the related figures. In order to illustrate the comprehensive overview of BASF’s value creation and to use the possibilities of online displays we created a tab version for the Annual Report 2016. The figures are arranged in a box system. A klick on each box leads to detailed information in the report. This design solution provides a clear structure of how the business model transforms the inputs into various outputs. It also works full-responsive. In its Annual Review 2016 ArcelorMittal also shows the “value creation for society” in an infographic. Whereas the examples above chose a horizontal approach, the presentation here is vertical – beginning with the input and the ressources the company uses, below the business strategy and the business itself follwed by the created value. After clicking on the graphic detailed informations including the key figures of in- and output appear. As regards the content the integration of the shareholders is nice – both the interest groups that are comprised by the sustainability framework of the company and the shareholders that benefit from the created value. Links on selected topics such as the business strategy or sustainability framework lead to more information within the report. After all the infografic provides a good overview but the vertical composition turns out as a disadvantage – especially the detailed view requires to scroll a lot which leads to a lack of clearity. 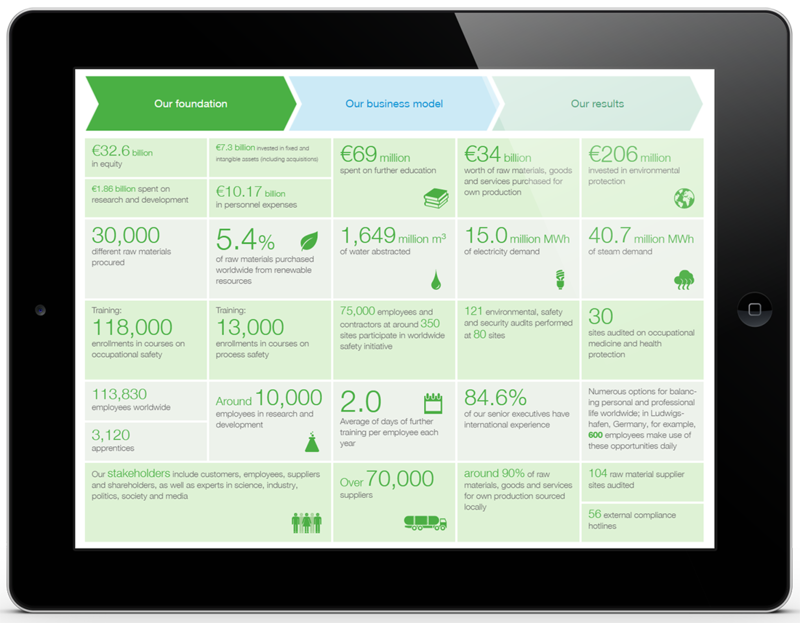 Interactive Online Reports offer a lot of possibilities to show how a company creates value. The shown approaches are unified by the intention of engaging the stakeholders by interactive elements and content that has to be explored. They are also a way of connecting information of a very complex report within an easily understandable overview.